More details are starting to emerge from the enormous tornado to rip through Oklahoma yesterday. Wind speeds were measured over 200 miles per hour. As of Tuesday morning, authorities had put the death toll at 24 but rescue crews were continuing to sort through the rubble looking for more casualties. Here are a couple YouTube posts from storm chasers who were on the scene for yesterday's devastating tornado in Moore, Oklahoma. Listening to their voices, you can really get a feel for the huge magnitude of this tornado. 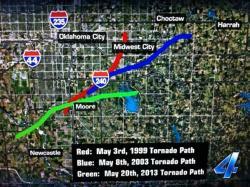 Oklahoma tornado paths: Three tornadoes have taken vary similar courses near Oklahoma City in the past 15 years.Courtesy OklahomanickThis map shows that three major tornadoes have taken very similar paths through this section of Oklahoma in the past 15 years, all occurring in May. The May 3, 1999 tornado killed 36 people and was rated EF-5, the strongest ranking on the tornado scale. The May 8, 2003 tornado was rated EF-4, but no one was killed. 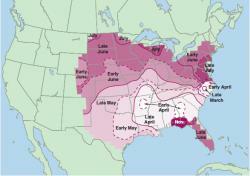 It is almost a certainty that the 2013 tornado will also be rated EF-5. Click here to access an interactive slider graphic showing before and after aerial views of the destroyed Plaza Towers Elementary School building. Satellite view: This satellite image shows the storm system that spawned the deadly tornado.Courtesy NOAANOAA (National Oceanic and Atmospheric Administration) captured this image of the storm system that spawned the tornado that hit Moore, Oklahoma. The storms’ violent updrafts sucked in air that shot up 40,000-50,000 feet or more into the atmosphere. The bubbly white structures you see in the image are known as overshooting cloud tops and are textbook features of violent thunderstorms. A couple months ago, USA Today reported on global climate change's impact on tornadoes. You can read it here. Trying to draw conclusions about the impacts to this type of weather is twisted, to say the least. Weather.com's Greg Forbes surveys the damage and gives his insights on the strength of the Oklahoma tornado. Minnesota-based meteorologist Paul Douglas today gives some great analysis, and some amazing radar images, in the Start Tribune today on why this storm turned out to be so big and powerful. He also reviews the good and the better weather apps to have on your phone or mobile device to help you know when bad weather is coming. Storm shelter: This commercially made storm shelter made of steel can hold up to six people.Courtesy Survive-a-stormNational Geographic shares information about how uncommon it is for tornadoes to hit developed, populated areas along with some of the basic science on what makes tornadoes occur. USA Today reports that the phone is ringing off the hook for this tornado shelter sales company. A 4-by-6 steel shelter that can hold up to six people runs about $4,000. The demand is highest in the southern states where most homes are built without basements. And here's the link to MDR's earlier post on the tornado, showing its movement in time lapse photography. Tornadoes form in regions of the atmosphere that have abundant warm and moist air near the surface with drier air above, a change in wind speed and direction with height, and weather systems such as fronts that force air upward. The United States provides these three ingredients in abundance, so it is not surprising that the majority of the world’s reported tornadoes occur in the USA. Within the United States, tornadoes can occur in nearly every state and in every month of the year. Wisconsin has experienced tornadoes in every month except February. It is generally accepted that tornado season begins in the springtime— and that is now. Tornado season is based on when the ingredients for severe weather come together in a particular place. Because a change in wind with height is closely related to the presence of a jet stream, tornado season moves north and south during the year with a jet stream. Tornado season peaks in March and April in the Southeast but not until July in the upper Midwest and Northeast. The deep South has a secondary peak in tornado occurrence in November. Tornadoes can also happen at any time of day or night. However, they thrive on solar heating and in some cases the ability of warm, moist air at the surface to penetrate the capping inversion. Therefore, the most likely times for tornadoes are late afternoon or early evening. More than half of all U.S. tornadoes occur during the hours of 3:00 PM to 7:00 PM local time. 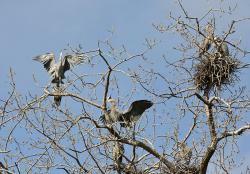 High-rise homes: A great blue heron rookery like this one was almost completely wiped out by Sunday's tornado in MinneapolilsCourtesy wikimedia commonsIt wasn't just humans hurt and displaced by Sunday's sudden tornado that hit north Minneapolis. A great blue heron rookery on an island in the Mississippi River along the path of the tornado took a tremendous toll on the birds. You can read more about it here. The story includes some pretty cool accounts of heron chicks being rescued. A number of severe thunderstorms have swept through the SE US recently. Some storms generated tornadoes that were truly devastating. The news channels have many photos of the ground destruction. We can see the path of the storms in satellite images. Here is a link to one of those images. A comparison of 250-meter resolution image from a NASA MODIS instrument at 0.65 µm and 0.87 µm visible channel images centered on Tuscaloosa, Alabama on 28 April 2011 showed signatures of a few of the larger and longer tornado damage paths from the historic tornado outbreak (SPC storm reports) that occurred on 27 April 2011. The yellow arrows point to some of the paths. This made all the weekend news clips, but here's a little more extended version of the storm chaser video of the Wilkin County. Minnesota, tornado from Saturday. They promise us that spring is coming, and storm season won't be far behind. Here's some wild storm chaser video of tornadoes and slow-motion lightning strikes. Enjoy! A rare February twister killed 8 and damaged property in Oklahoma yesterday. Tornadoes are uncommon in Oklahoma in February. Since 1950 they have had 44 tornadoes in February, most recently back in the year 2000. It's still at the observational stage, but investigators are looking at the link between strength of garage doors and the amount of damage a home incurs from a passing tornado. After reading this Star-Tribune story, it sounds like a case of the general public connecting the dots before the scientific community. USA Today has an interesting follow-up on the Hugo tornado that struck last week. While there's a lot of massive destruction, there are also a lot of weird, finese things that happen, too. 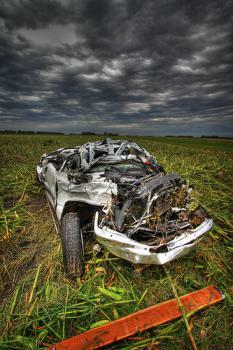 Chevy v. Tornado: It is a car smashed by a tornado. But neither the car nor the tornado from the video link in this post.Courtesy Orfield Photography (via Flickr)Totally sweet video of a tornado smashing up some cars. The best is the two cars that get lifted and smashed together. Though I will say it looks like it missed the nearby Honda Element. Too bad.